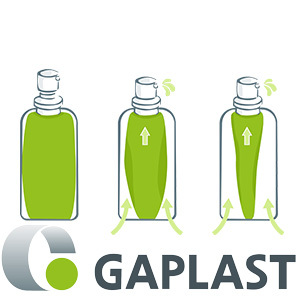 Gaplast provides packaging and applications of plastic, for the pharmaceutical, cosmetics and medical applications which includes `Airless Motion®. It belongs to Airless Motion® products category. It is pumps with snap-on, crimp and threaded neck. Applications: liquid and semi-solid products, pharmacy, etc.Airless container for pump and squeeze applications In order to protect sterile products without a preservative in a multi-dose container, high-tech packaging materials are required. The multilayer container (hybrid packaging) consists of a rigid outer layer and a flexible, puckering integrated inner bag. This bag can completely drain an airless pump without entering contaminated air, during the entire collection.APPLICATION AREAS AND USER ADVANTAGES • Integration of barrier properties into the inner bag for absolute protection against chemical, physical and microbiological contamination. • Product formulations usable without preservatives. • A decorative layer, such as soft-touch or highgloss, is possible as the outermost bottle layer. • The only airless system with absolute freedom of design that can be applied to all containers of a product line of customers. • By a true 360 ° use, the product can be applied at any angle. • High dispensing rate or low residual volume due to a controlled folding of the bag. Your message will be sent directly to Gaplast GmbH and will be answered at their discretion.